Over the past two weeks, I've learned a very important lesson: If you are sitting in your downstairs bathroom and hear a strange drip noise that you can't quite locate, it's time to pack up and head for the hills. Sadly, the most exciting parts of this story don't have pictures, mainly because there was too much screaming and crying going on to reach for the camera, so bear with me as I paint a picture with my words. So the day after I'd first noticed the strange drip, drip noise, I was back on my favorite downstairs toilet. Thank goodness, thought I, that strange drip noise has gone away! 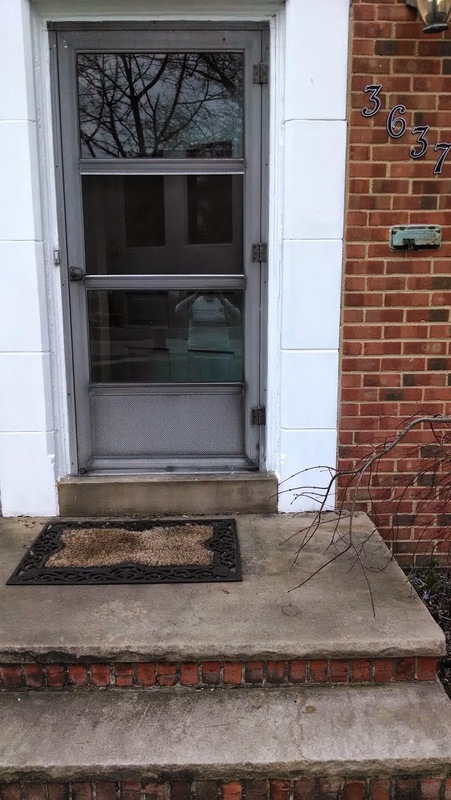 It must have been outside after all. My satisfaction at a logical reasoning job well done was short-lived however and my smile evaporated (no pun intended) when I yet again heard a clear DRIP. 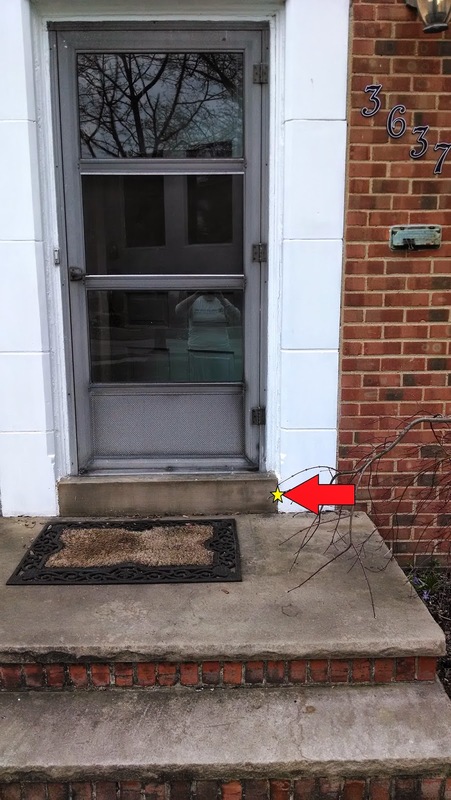 My business concluded I crept onto the basement landing and peered around for a cause. DRIP. It was clearer now and I began descending the stairs with mounting trepidation. DRIP. I vaguely wondered if an evil serial killer was making this noise to lure me downstairs and kill me. DRIP. Surely the chickens in the next room would make some kind of warning noise if their mommy was about to be murdered. DRIP. A drop landed right at my foot and I looked up and decided to run away from home. The ceiling above me was drooping in, big, wet drops slowly forming and slipping away from the crack at its lowest point and tumbling down to splatter on the last bit of non-Greta-ruined carpet in the house. I remember saying something that we'll assume was "dearie me!" 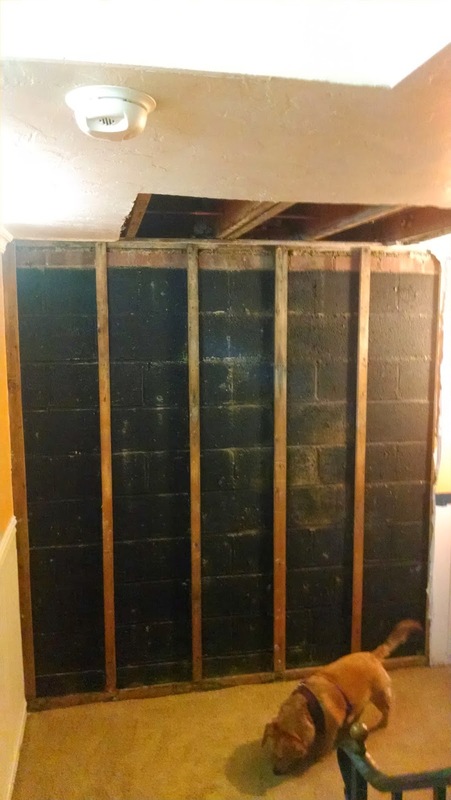 before I ran into the unfinished basement, grabbed a screwdriver and an old food storage bucket that still had a cup or two of cocoa powder coating the bottom and ran back to face the engorged ceiling. I slammed the bucket on the carpet under the drip and bravely punctured the leak, wondering if the whole house was about to come down on top of me. More exciting words slipped out as a gushing stream of water plowed out the hole and began to fill the bucket. It streamed and streamed, as I ran frantically to the maze of waterlines that line the ceiling of the unfinished basement and began randomly twisting spigots shut. When the stream tapered off, I got up the courage to increase the size of the hole, and was grateful I didn't get to drink from the fire hose. In the time since my initial adventure, we called insurance, had house dryers come out and put fans in the basement. 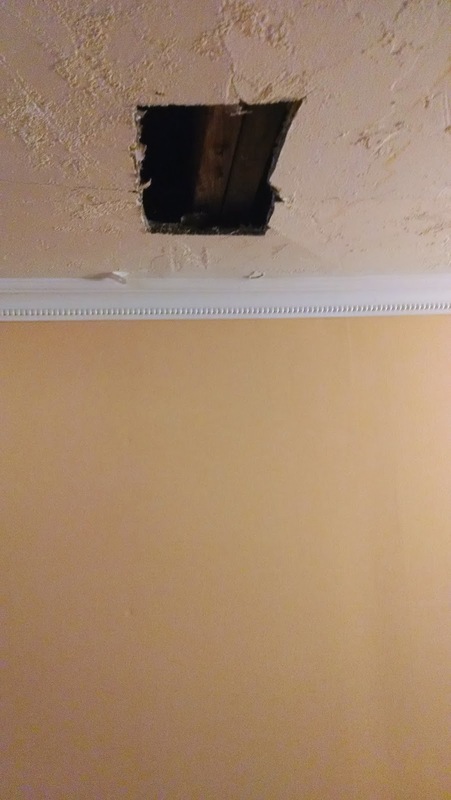 The house dryers cut open our ceiling and found "the cause." So...that wasn't just a skylight?? So now we'll play a game: find the hole from the outside of the house. Ready.....GO!! Check me out--maintaining the weight loss. If I was James Cameron, there'd have been a lot more mistakes in Titanic. Give up? So did the house dryers. They stuck a clothes hanger through the hole from the inside to see where it would come out. It's like some sort of cunningly camouflaged poison dart--like that Soviet umbrella tip assassination all over again! 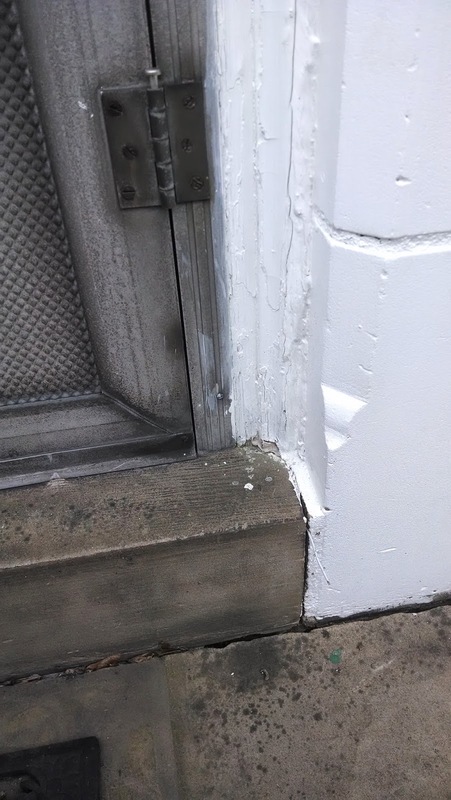 So by now you probably have some questions, like "wait--how did all the water get in there all the sudden if the leak is coming out perpendicular to the ground?" "you know, it hadn't rained for several days before the leak, so how...?" 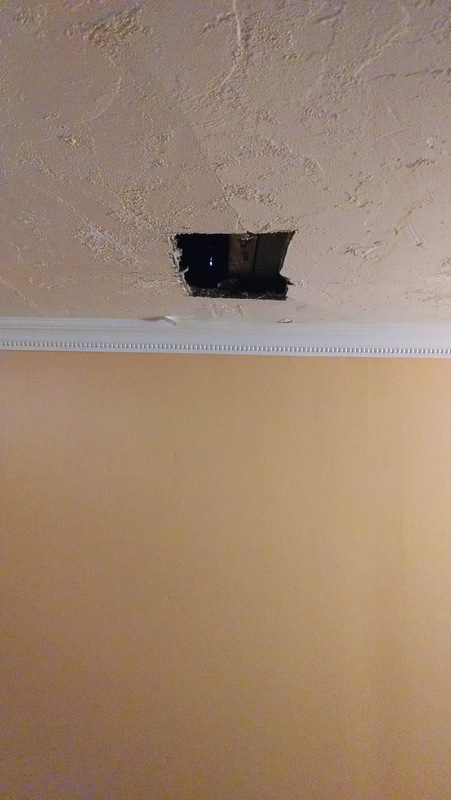 or my personal favorite, "why is the ceiling still leaking if it's not raining and I just patched up the 'leak'??" Check out that action shot! Now I'm like James Cameron in Avatar! 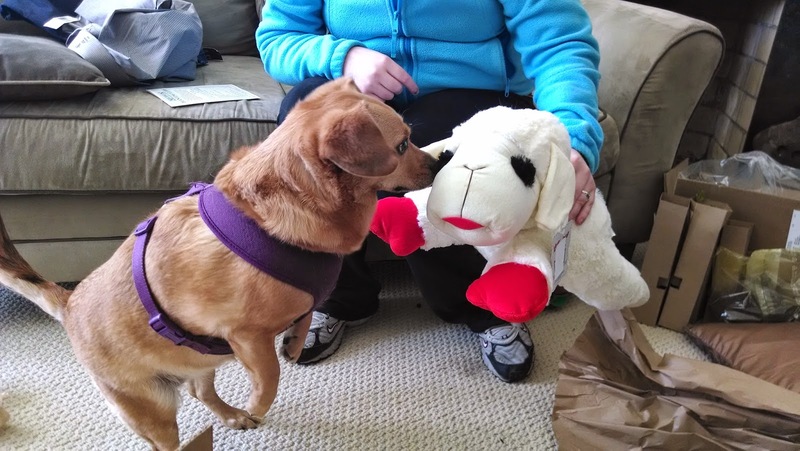 Greta's deeply enjoyed this process and meeting all the workmen. Here's she's admiring the way the house dryers cleaned and freshened the carpet. Or she's smelling yet another leak that has been the actual problem all along. At this point, the leak has been fixed (plus a new washer inserted in the spigot outside to help things work better--the spigot issue was unrelated to the leak), everything has been re-dried with heavy duty fans and dehumidifiers. We're hoping a lot that insurance will cover this little project, especially fixing the plaster ceiling, but fortunately, they were able to recover all the wainscoting and trim from the wall before they took it down, so that repair (though it will be horrible) will not be the end of the world. Now, because I'm sad because my house now has a weird scary crypt corner in the basement, I leave you with Greta's storyline for the past couple of weeks. 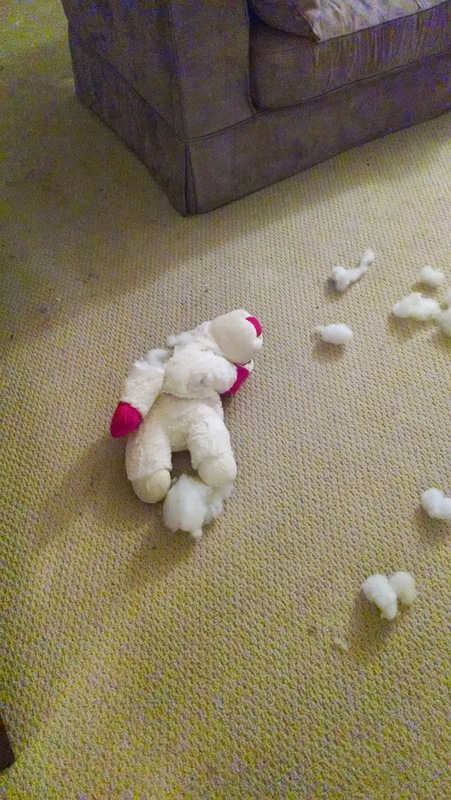 RIP Lambchop. I want to be clear that I didn't pose him. That's just how Greta left his poor, broken body. Somehow, laying like that, he looks more dead than any actual dead thing I've ever seen. I want to say this is just how Greta plays, that's she's probably not an evil psychotic murderer, but then I saw the way that she had plucked off his eyes and left them stacked neatly in a corner. Until next time (as long as Greta doesn't get to us). Honestly, Fall is my favorite time of year. Halloween, leaves changing, Halloween, school starts again, Halloween. But after this terrible, horrible, no good, very bad winter, I am thrilled to see Spring again. Spring is kind of a challenge for folks with fertility issues. Everywhere you're presented with babies! Baby plants, baby animals, baby humans. We celebrate the earth springing forth with life. We celebrate Mother's day. We festoon our homes with baby chick and bunny décor and chow down on Peeps and Bunnies from the JustBorn company. The only way I can deal with all of this fertility is to do things that make me feel like a mom. I exercise my own creative power (as in power to create, not imagination). The main ways I do this are raising chickens and growing a garden. We've had them for a week. It's awesome to see them grow, interact and explore their world. They've grown up quite a bit in a week. Admittedly, their heat lamp is not flattering. This image gives a view of the closest chick's wings, which are starting to feather out. The black chick is developing tail feathers. I will miss their sweet fluffy down!! Soo...here's the sad part. 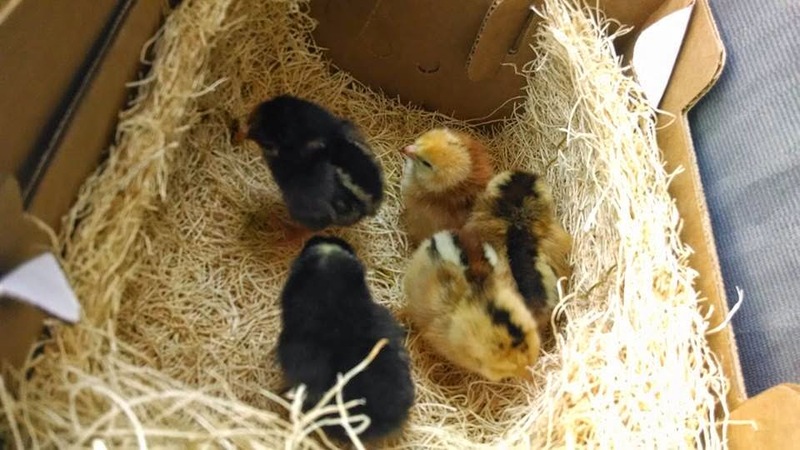 There are five chicks in the top photo and only four below. We lost one of our easter-eggers (they lay blue, green or even pinkish eggs!) on Saturday. She wasn't doing great for a couple of days and we separated her from the flock, gave her special food and water, and lots of love, but she didn't make it. Losing these chickens is basically an expectation that you go into this with, but it's still hard to see one suffering. I'm more upset when a chicken is sick than after it dies. That is probably not very motherly of me, but I'm okay with myself. Right now the chicks are a little mad at me...it could be that every time I go down there they get disrupted, with food, water, or even their habitat changing. Or it could be that Greta the Dog sticks her head in their box and tries to smell all of their bottoms. Greta better get her jollies while she can. Once our last chickens were grown, they would peck her nose when she'd start sniffing around, and even chased her a couple of times. 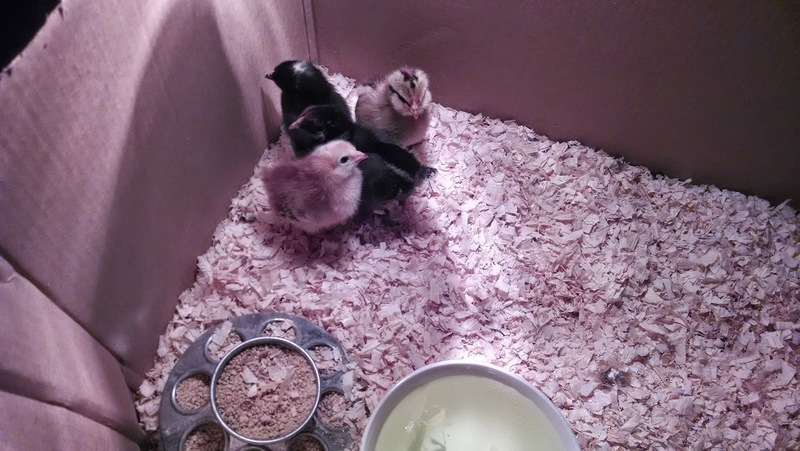 Once they pinned her under their house, one pecking her on either side. She screamed and screamed. And that's how I learned that dogs can scream. It occurs to me that that story is also not very motherly. My afternoon project. The plants I bought Monday were haunting my nightmares. We deeply enjoyed listening to the General Conference of the Church of Jesus Christ of Latter day Saints today. The messages were so enjoyable and I felt the love of Jesus Christ so intensely. Consider checking out some of the messages here. My favorite talk can be accessed here. It is by the Prophet and President of the Church, Thomas S. Monson. It's about 15 minutes long and discusses the importance of loving service and help to others. After a day of watching TV, even if it was spiritually edifying, I needed to get outside. I had bought plants on the same day I picked up the chickens and couldn't deal with not planting them anymore. 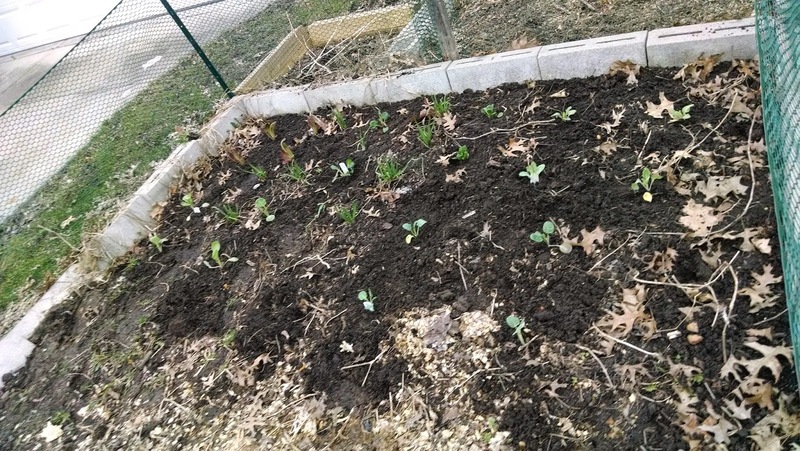 Some folks today were asking me for garden advice, and I felt like a charlatan knowing my cold weather plants were rotting away. My garden wasn't fully prepped the way I'd like it to be. I wanted to till it before I started. But, I also had some surprise garlic and onion holdovers. The garlic is kind of a godsend--for lettuce and other tender plants, nearby garlic can ward off the insect pests that might otherwise attack it. So I'm just prepping as I go. 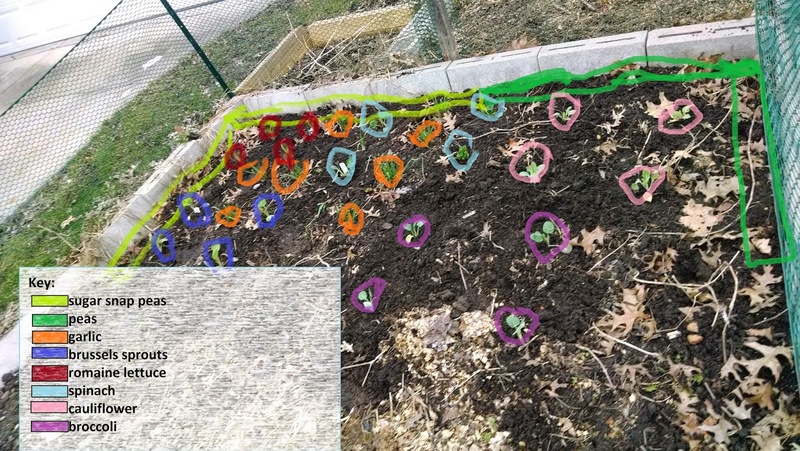 Because I know you find everything I do as fascinating as I do, I have provided a diagram of my plantings for you. I can honestly say I'm more proud of this diagram photo than of anything else I've ever created. It's another one of my babies!! So, it's been a bit since I wrote on the blog. For a while now I've wanted to get it up and running and here it is!! So in the ongoing crisis that is our fertility situation, I ultimately came to a realization: I don't have to "save up" the fun things I want to do for birthdays, holidays, etc. until I have kids. I've got the time and energy now, so why not celebrate myself by doing awesome things? I will tell you why not: it is incredibly hard work. Take today, for instance. Today is April Fool's Day (aka, the worst holiday ever that I hate). I play practical jokes a lot. (mainly jumping out and scaring Greta as she wanders around the house). But I'm a firm believer in doing funny things if you're funny and not doing things that you think will be funny but aren't if you aren't funny. (there's no better way to write that). But on April Fool's Day, everyone seems to think they've got carte blanche to do whatever they want. So they end up doing stupid, reckless and hurtful things in the name of humor and it makes me unhappy. 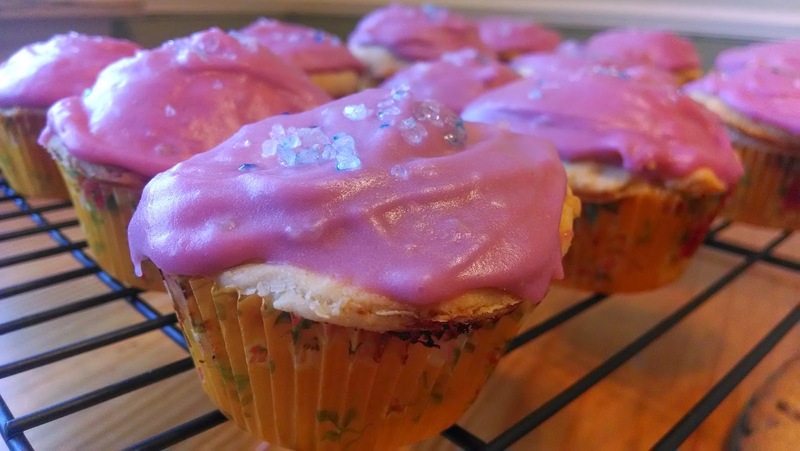 ANYWAY...last year, a clever friend of mine posted a picture of a non-awful trick: she'd made meatloaf "cupcakes" with mashed potato "frosting." That got me thinking and I decided that this year, I'd play a similar trick on Brandon. 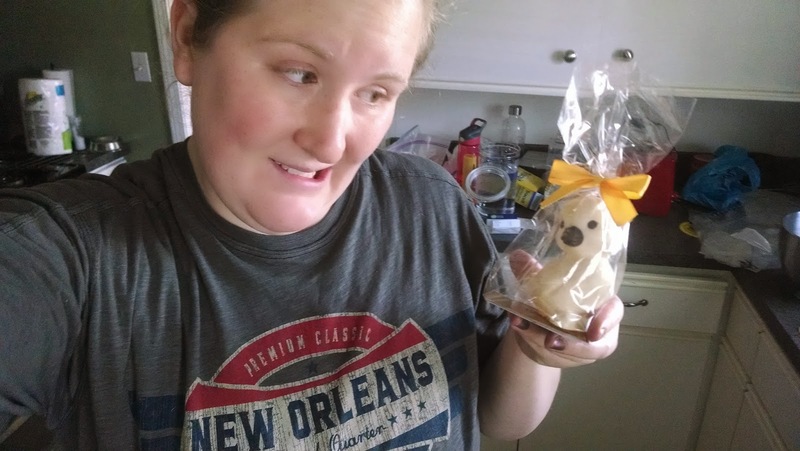 There are a lot of awesome April Fool's Day tricky foods out there (I saw a picture of a bundle of asparagus that was actually a chocolate cake!!). To be clear: IMHO, the only acceptable April Fool's Day foods are those that are a pleasant surprise. NO laxative brownies, surprise gross mystery ingredients or inedible foods substituted for real foods. To that end, I decided we'd have pizza and cupcakes for dinner, but not necessarily in that order. The other hard thing about being so whimsical today is that I didn't check the meat or cooking ingredients that I had (I'm kind of a fly-by-the-seat-of-my-pants April Fool's Day cook) and Brando had the car so I had to make due. So instead of the adorable and beautifully presented meatloaf cupcakes, I made twelve small chicken pot pies. (this upped the workload to the point that I literally did nothing but make this food all day). Here's the result (with a bit of my creative process thrown in). 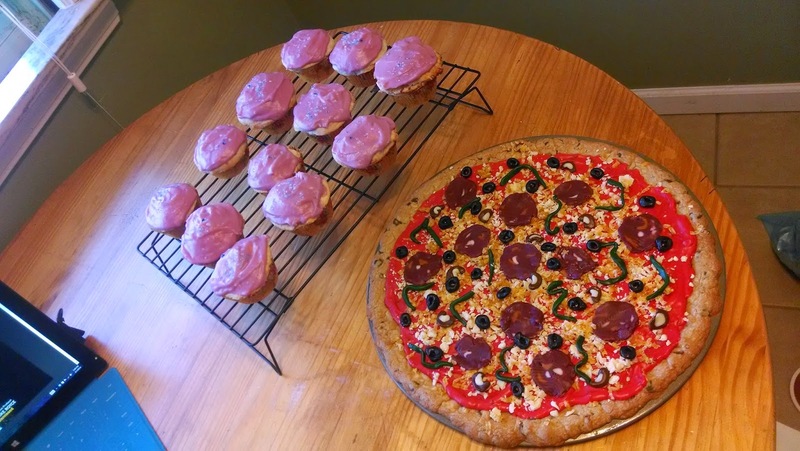 Pizza and cupcakes or cupcakes and pizza? I made a nice simple fondant while the cookie was cooling and used it to form the mushrooms, pepperonis, green onions, black olives and cooked cheese you'll see later. 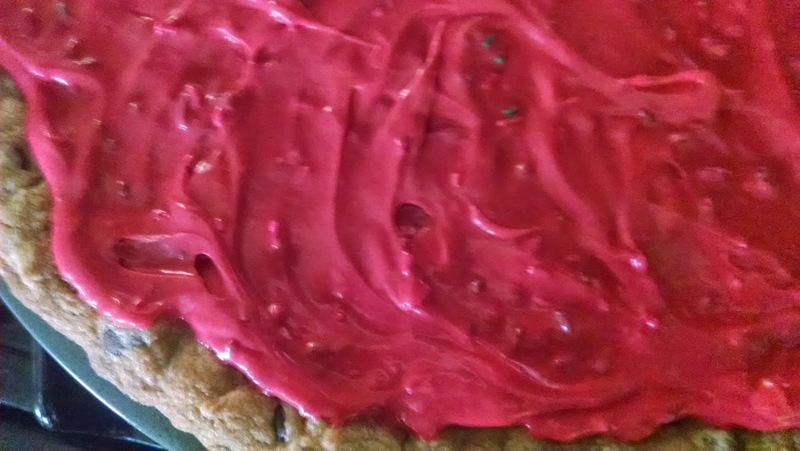 But the first thing I added to the cooled cookie was the tomato sauce. 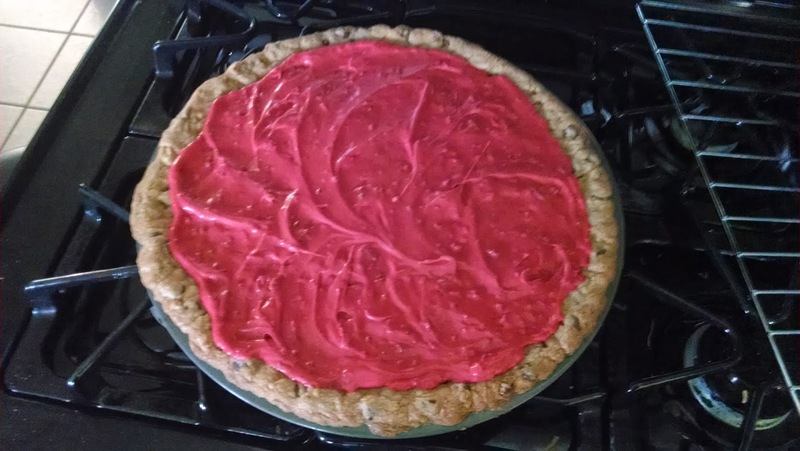 I made a simple frosting (butter, salt, powdered sugar, cream) added A LOT of red food coloring and a little brown to make it more tomato-ey. 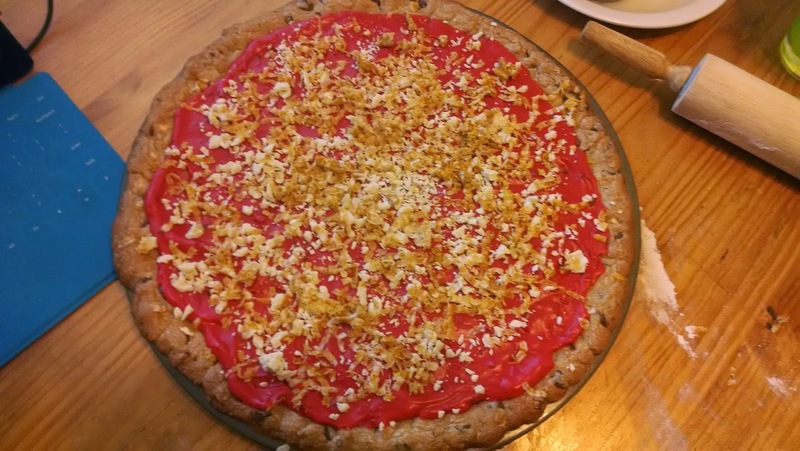 I put in red and green sprinkles to make it look more realistic (like herbs in the sauce). 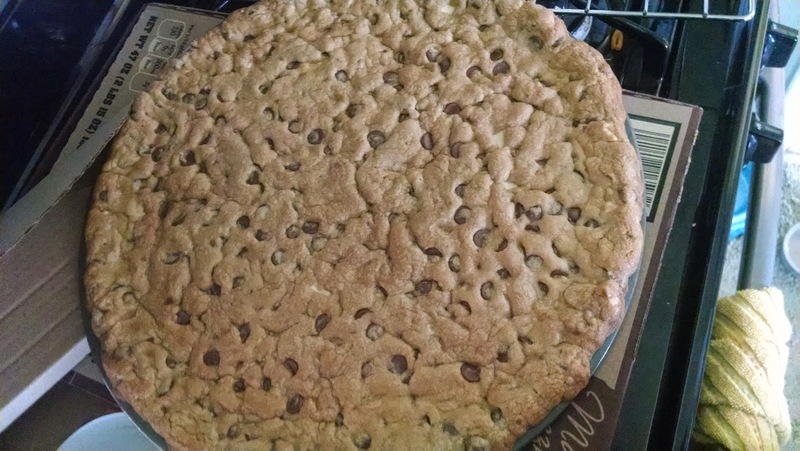 Unfortunately, I had squandered all my white chocolate making the giant cookie, so a sacrifice needed to be made. 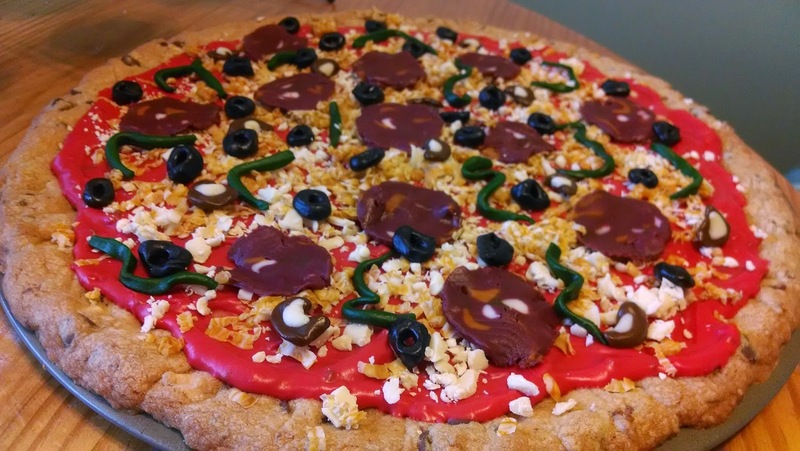 All the toppings are fondant. 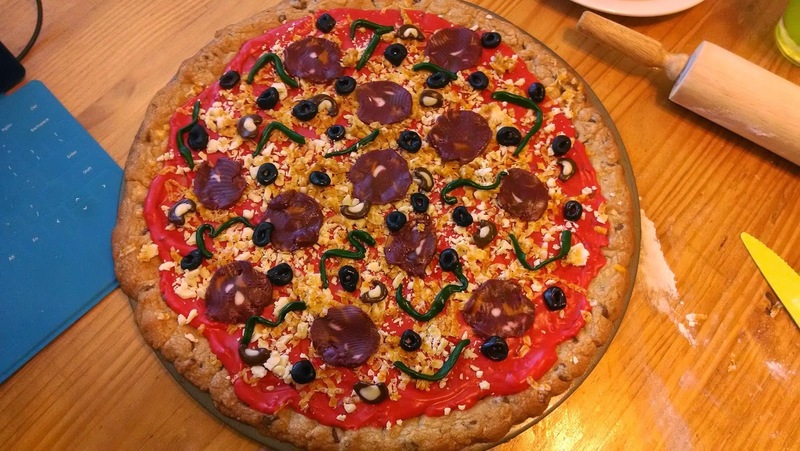 I spent a long time making "realistic" fat and other unidentifiable deposits in the pepperoni. The snakes were intended to be green peppers (which Brandon is allergic to (my only venture into the crueler aspects of the holiday)). The brown and white things are my attempt at canned mushrooms. All in all, I'm pretty happy with how it turned out! Okay, so the pizza was mostly fun. The cupcakes were mostly awful. I used this recipe and it was awesome--it tasted ridiculously good. Brandon had 3 cupcakes for dinner. But it was so time consuming. I did make one fairly major change to her recipe in that I cooked the bottom crusts in the cupcake papers for about 10 minutes at 350F. This ensured (in my mind at least) that they wouldn't be soggy and underdone when everything else went in together. The crust turned out fabulous and the tops and bottoms sealed up fine even though the bottoms were already cooked. I whipped up mashed potato "frosting" in the spirit of my friend's beautiful creations from last year. Tragically, where her potatoes were stiff and malleable, mine were...gooey. 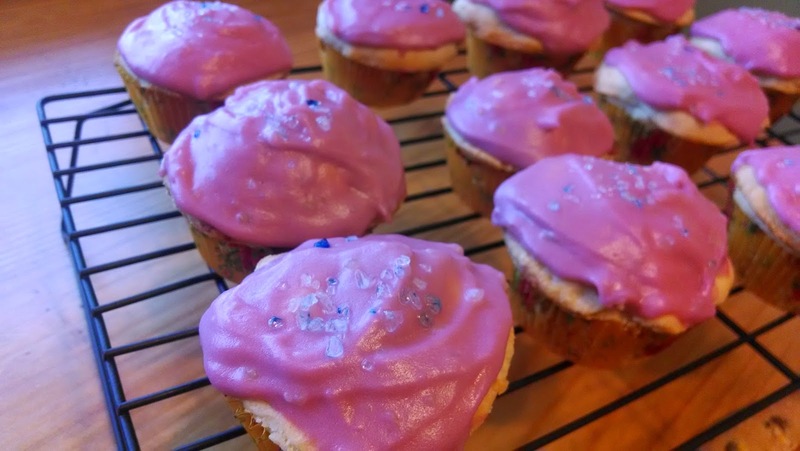 They tasted really good though, so I went with it, dyed them pink and added a few sprinkles (coarse sea salt mixed with blue food coloring). When Brandon got home, I proudly presented dinner, which he accepted with a HUGE amount of trepidation. I think maybe I was *too* excited. But then he loved them! !